Successfully Added Unlocked Touchscreen Dual SIM Dual Standby Cellphone to your Shopping Cart. Unlocked touchscreen dual SIM dual standy cell phone, Newsmy branded high quality mobilephone. This modern unlocked cell phone is a dual-band (900Mhz, 1800MHz) GSM/GPRS mobile with two SIM card slots (Dual SIM with dual standby) allowing you to have two active phone numbers within the same phone. In addition, this model has plenty of easy to use PDA type productivity tools and media functions. The signature functions include; modern phonebook + contact manager, easy to use keypad, MP3/MP4 players, digital camera(s) and video recorder, image viewer, portable file storage, Ebook reader, Bluetooth, and daily software tools. You have been asking for it, and here it is - a famous branded mobile phone! Newsmy is one of the top brand mobilephone and portable electronics manufacturers in China. We are happy to offer this model (the first of many to come) to our wholesale customers. You will find the quality of this brand to be as good as anything you could get from Samsung, HTC, etc., but at a much better price. The CVFV-M06 Newsmy touchscreen mobile phone is proudly brought to you by Chinavasion Electronics. Order your stock now and don't forget to check our mobile phone accessories section to see our selection of Bluetooth speakers and earpieces. 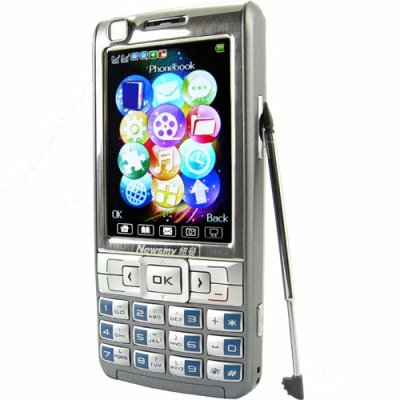 Unlocked touchscreen mobile phone with two SIM slots, Bluetooth, and easy to use keypad.